In 1939, David O. Selznick and his staff established a recommended presentation policy for Gone With The Wind that was based, in part, on reserved seat presentations dating back into the early silent era. That policy was essentially the basis for "roadshow" presentations for the next four decades. The key words in roadshow presentations were "quality showmanship", an art seemingly lost. Mr. Selznick's policy is included among those shown below. If you have never seen a film presented in roadshow format then you have our sincerest sympathy. Beautiful, well appointed theatres at least 100 miles apart. Reserved seats. Bookings running from three to nine months or more. A maximum of three showings daily. No popcorn. Expensive candy bars. Courteous ushers and knockout usherettes. It was called showmanship, and until the quality of the films presented went to hell, it paid off handsomely. Sadly, almost all of the theatres listed above are now gone. There are currently six documents here that give the reader some idea of how showmanship was encouraged by both the BIG studios (i.e. 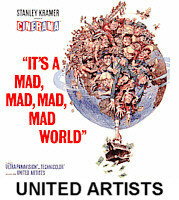 MGM, Paramount, United Artists) and the tiny studios (i.e. Selznick International, Allied Artists). You can begin your research on roadshow presentations with David O. Selznick's Gone With The Wind. The presentation instructions were included in the materials shipped with the print itself. The presentation instructions for Ben-Hur were provided to the exhibitor in the "Exhibitors Promotional Portfolio", a glitzy name for a rather glitzy press book. 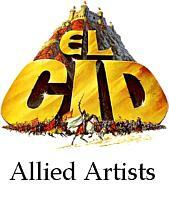 El Cid's presentation directions were provided in the form of two typed pages of cue sheets. Despite the differences in getting the message to the theatres, the two films wound up being shown in very similar fashion, IF the theatres paid any attention to the instructions. The materials shown here for Cecil B. deMille's The Ten Commandments are from the original roadshow presentation in 1956 and the general "popular price" release. It is interesting to see how Paramount handled the two different release tiers. The instructions for both West Side Story and It's A Mad, Mad, Mad Mad World depart from the more traditional roadshow techniques. Their instructions make interesting reading.